School staff and administrators can train and hire employees with this teacher job description that can be adjusted for any grade level in terms of responsibilities and certifications. Creating and implementing lesson plans. Using technology to aid in the teaching process. Working with parents and other teachers to get the most out of every student. 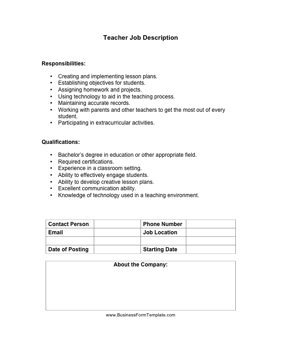 Bachelor's degree in education or other appropriate field. Experience in a classroom setting. Ability to effectively engage students. Ability to develop creative lesson plans. Knowledge of technology used in a teaching environment.